Faith is Restored – Hear Me Roar. After weeks of searching, after the withdrawals and cravings came and went, after we hit rock bottom and had all but given up, just when the last drop of hope was lost, we did it. We stepped off the ferry this morning after an exotic hour walking through a fish market – appetites restored from the fresh sea breeze after nearly puking at the sight and smell of a harbor (yes, my vegetarianism is affirmed). Passing by what looked to be an ordinary street stand, a familiar silver gleam caught uncle David’s eye. Could it be true? No, the lingering pescatoral smell must be making him delirious. Upon closer examination and a slap in the face to ensure he wasn’t dreaming, there it was. 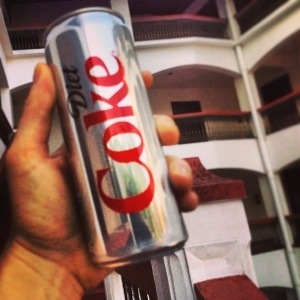 HALLELUJAH, GLORY IS THE DAY THAT WE FOUND A CAN OF DIET COKE!!!!!!!!! And yes, we bought not one, not two, but every single can of diet coke that man had to offer. He even went to his storage locker where he had a secret stash. Grandma came down with a pretty nasty cold yesterday so she slept instead of joining the morning exotic hour, but when we delivered the cure-all diet coke to her door just as she woke, her spirits lifted and she is magically healthy again!!! Thank you little man at the street stand for the healing elixir – the nectar of the gods – the fruit of the loom – the liquid gold that you have bestowed upon us. We are eternally grateful. jungle walk, where we didn’t see much more than monkeys and birds, but it was a really cool way to begin the day. The fog rising from and drifting along the river as the sun rose was spectacular, and the bamboo raft we used to cross the river was quite cool. rubber plantation: there is only one guy who mans the entire plantation! He collects the rubber sap from 800 trees and then mixes and processes it all before noon. Wed: Unfortunately our elephant ride was cancelled because not enough people wanted to do it. What’s the point of being in India without riding on an elephant?!! Instead, I did get to enjoy our first truly relaxing day of pool lounging, banana lassi, and yoga. My body is still sore from the deeeep stretches. It was one of the best yoga classes I have ever been in because the teacher gave very individual attention with adjustments in the poses, as it was just Shanon and I in the class. He also bestowed a few pearls of wisdom upon us regarding what it means to be a teacher. We made it just in time to see the oldest synagogue in India, just before it closed. No pictures were allowed, but there were some Belgian Chandeliers that were just so beautiful and ornate, made of crystal and brass. Truly a sight to see. In other news, I have also decided to entertain myself by taking covert videos of various members of our trip doing the snap-and-check, asking Lakuma over and over and over what time to meet and where, and exactly what is happening next. It’s to the point where I want to just write on Lakuma’s forehead in bold black sharpie meet at 7am. Unfortunately I can’t post videos on here, but I’ll find a way to distribute once the trip is over… muahaha.